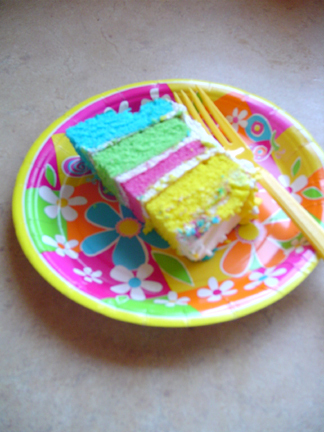 I promised to come back with another celebratory plush pattern — and of course, it’s the rainbow cake slice pictured in the blogiversary posts here, and here! You may notice that it shares the same colour palette as the plush clutch :D It is also based on my moon cake pattern, with a colourful twist. And if you’d like to make some real edible rainbow cake, here’s a recipe. One can even make some rainbow pudding! Looks like a trip to the baking aisle is in order. 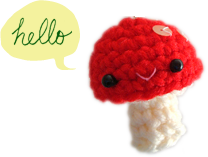 In the meanwhile, if you’d like to make the crochet (inedible, but cute!) rainbow cake, here’s how it’s made — all you need is some yarn, some free time, and some love. Row 1: ch 2, 2 sc in second ch from hook, ch 1, turn. Row 2: sc in first sc, 2 sc in next sc, ch 1, turn. Row 3: sc in first sc, 2 sc in next sc, sc in next sc, ch 1, turn. Row 4: sc in first sc, 1 sc and 1 hdc in next sc, hdc in next sc, sc in next sc, ch 1, turn. CORRECTED! Row 5 (ruffles): ch 2, in front back loop only, sl st in 1st sc, [ch 2, sl st in next st in front back loop only] 4 times. Leave a long tail for sewing, fasten off. Follow pattern for row 1–4 of top of cake slice. Fasten off. Row 1: ch 6, sc in second ch from hook, sc in each ch across, ch 1, turn. Row 2: sc in first sc, 1 sc in each sc across, ch 1, turn. Row 3–7: Repeat row 2. Fasten off. Row 1 (wrong side): ch 12, sc in second ch from hook, sc in each ch across. Row 2 (right side): join white, fasten off blue. With white, ch 1. In back loop only, sl st in each sc across. Row 3 (wrong side): join yellow (or the colour of middle layer of cake), fasten off white. with yellow, ch 1. In front loop only, sc in each st across. Row 4 (right side): join white, fasten off yellow. With white, ch 1. In back loop only, sl st in each sc across. Row 5 (wrong side): join orange (or the colour of top layer of cake), fasten off white. with orange, ch 1. In front loop only, sc in each st across. Fasten off. Leaving a 6″ tail, ch 4. 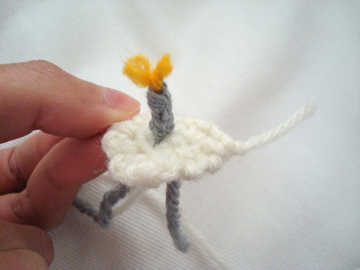 Remove hook from loop, tie a short length of yellow yarn to loop, then pull the loop close. 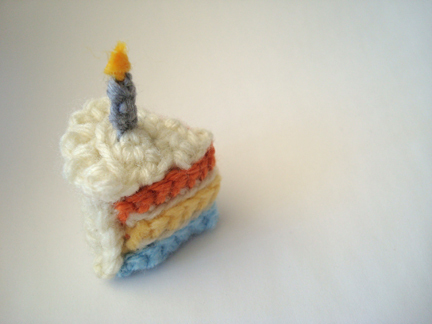 When the whole cake slice is assembled, fray the short yellow yarn tails that are supposed to be the flame. 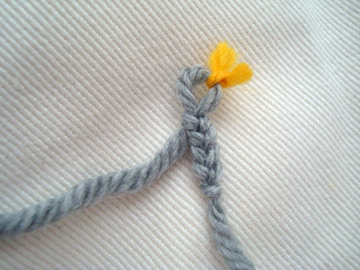 With a drop of white glue, roll the yarn tails together between your thumb and index finger. You might have to clamp it with a clothespin for a few minutes for the glue to dry. 1. Sew the long side of the rainbow part to the bottom of cake slice, along the 2 side edges of the bottom piece, with half the rainbow part sewn on one edge and the other half sewn on the other edge. 2. Sew the top of the cake slice to the rainbow part. 4. Stuff the cake slice through the open top edge, then continue to sew it close. (The top edge of the back piece is sewn to row 4 of the top piece — the row before the ruffles.) Weave in ends. I think it would make a great fridge magnet, either with a magnet permanently attached, or using this trick I mentioned at the end of the tater tot post. Thank you so much for joining me in my blogiversary festivities! I hope you enjoyed them. As usual, if you have questions or feedback about any of my patterns, please feel free to leave a comment or send me a note, I’d love to hear from you! thank you! your rainbow cake is magnificent! Looks awesome, Trish! It was also our wedding cake, but with different colours…I love it! Some is still in our freezer because Dan thinks we should eat it on our tenth anniversary.…we’ll see about that. Thank you! This is incredible. oh my goodness, i love this so much. 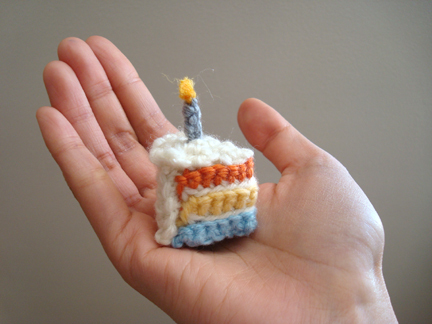 thanks for posting the pattern -it’ll be a perfect gift for my bestie’s birthday next week! 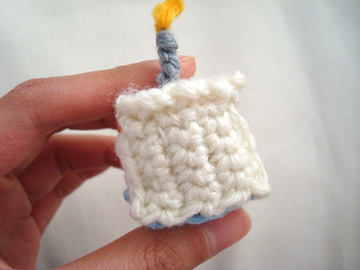 So Cute — thank you so much for sharing the pattern! Hey, Just wanted to let you know that I made your cake. Put it up on a blog about my little girl’s first birthday! I made mine out of brown though, because birthday cakes just NEED to be chocolate and messy in my opinion! Thanks so much for making this available to everyone! This turned out so cute! I used the advice posted earlier, using long tails and making the yarn the stuffing. It’s so tiny it really doesn’t need to be stuffed much. I’m making some for my son’s physical and speech therapists birthdays this week. awesome! i stuff my tiny plushes with yarn scrap all the time :D i’m sure the therapists will really appreciate your thoughtful handmade cake slices!